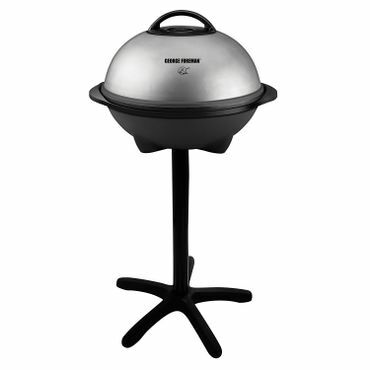 The Weber Q series still reigns supreme in our outdoor electric grill category. But there's some new competition for best indoor electric grill for this report update. There are also perennial favorites plus new entries from Zojirushi and a grilling version of the enormously popular Aroma SuperPot, along with a ceramic-coated griddle from Oster. Of all the electric grills we evaluated, the Weber Q-2400 gets the closest to real gas or charcoal cooking power. It boasts impressive build quality, temps adjustable enough to handle everything from veggies to meat, a substantial warranty, and enough oomph to quickly recover heat lost when you open the lid. Equally important for grill aficionados, the Weber Q-2400 gets hot enough to really sear foods, locking in their juiciness and flavor. If you can't decide between cooking indoors or outdoors, the 15-serving George Foreman GGR50B gives you the best of both worlds. Users love the in-lid temperature gauge and the sloped grilling surface that drains grease away, and the fully isolated heating coil means you don't have to worry about dangerous flare-ups while cooking indoors. 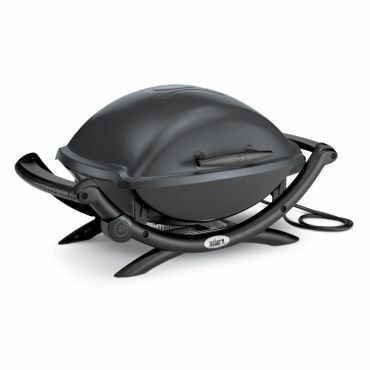 This grill is also surprisingly durable, and if you want to save a little space it's available in a 12-serving version. 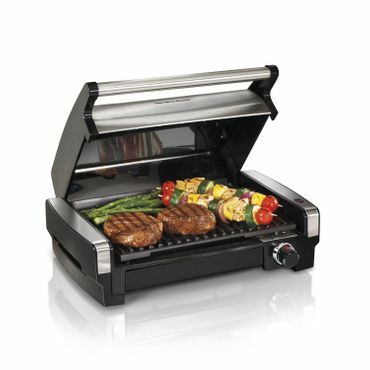 If you need a small indoor grill, the Hamilton Beach 25360 is perfect. This contact grill eliminates any concern about flare-ups, and the hood swings down to help control grease splatter. Sear performance may be a little bit lacking, but this little grill still locks in flavor well. The small footprint makes for easy storage, and it's light enough to tote around for tailgating parties, but still big enough for cooking a few hamburgers at a time. The mighty Broil King Professional Griddle PCG-10 offers enough cooking space to feed a small army, grilling up eight pancakes or a dozen pieces of bacon at a time. 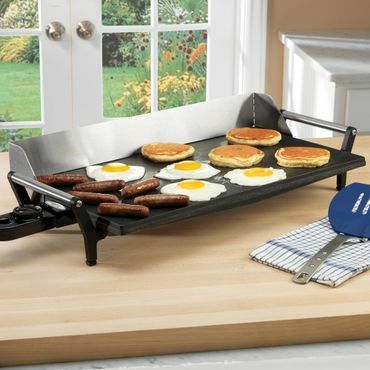 This griddle's heavy-duty construction and consistently accurate heat have made it the darling of experts and owners alike. The Broil King's ceramic non-stick surface and removable grease tray both clean up easily, and it features a removable backsplash to guard against grease splatter. 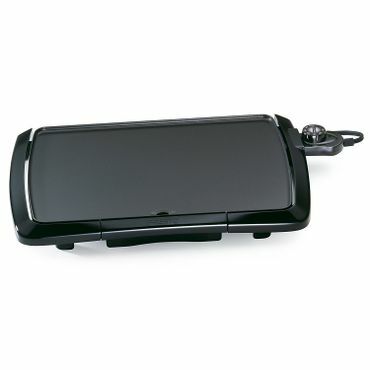 The Presto 07047 Cool Touch griddle is a great value for those who don't need an electric griddle very often. It heats up quickly and offers plenty of cooking space for most families, cooking up to four to six pancakes at a time. This inexpensive griddle is surprisingly durable too, despite its light build, and most of its parts are dishwasher safe -- if it fits. Users say that a few small quirks are easily managed. Barbecue purists might have a hard time letting go of their gas or charcoal grills (which we cover in a separate report), and for good reason: The fuel is an integral part of the cooking process, searing the food and imparting a rich, smoky flavor. But if you don't have the space for a conventional grill or if they're prohibited by your apartment or condo association, electric grills can give you that outdoor cooking experience without any of the risks inherent in playing with fire. Electric grills are getting better than ever at searing flavor into your favorite vegetables and meats; some models can multitask as panini makers or griddles, and some can even be brought inside to cook in the kitchen. Electric grills also offer a whole new world of convenience: No more struggling to light the charcoal, worrying about gas pressure in cold weather, or refilling propane tanks. Just plug the grill in and, after a short warmup period, you're ready to go. Some even have removable cooking plates that can go straight into the dishwasher for easy cleanup, a feature that busy cooks really love. The best electric grills are true cooking machines, so you won't find many complicated bells and whistles here. However, a few simple features come in handy on any grill, such as an in-lid temperature gauge. Because they don't have a lid, contact grills don't need a temperature gauge; but they should have an adjustable temperature dial, and a go-ahead light to let you know when that temperature has been reached. These look very much like traditional gas or charcoal grills with a domed lid and a grate that you put the food on. They are heated by a heating element that is underneath the grates. With these, you flip the food, just as you do with a regular grill. The big difference is that they tend to be much easier to clean -- many of these grills have removable grates that you can pop right into the dishwasher. Indoor/outdoor electric grills look very much like outdoor-only grills, but with a sealed heating element that make them safe for indoor use. These are the most versatile type, because you can use them on the patio in nice weather, and in the kitchen during the winter. Like traditional grills and outdoor electric grills, you flip the food, but it cooks on grates that are usually removable for cleaning. Indoor-only grills are usually contact grills that close to cook the meat from top and bottom at the same time -- in other words, both the bottom surface and the lid get hot. The food is placed between those surfaces, and the lid both flattens and cooks the items. Contact grills will cook things like burgers in half the time of traditional grilling because there's no flipping. This type of grill completely isolates the heating element from your food, eliminating the risk of flare-ups that could pose a fire hazard indoors. These can be used outdoors as well, as a tabletop grill, as long as you have an electrical outlet within reach. These flat cooking surfaces are very handy for cooking items like pancakes, toasted cheese sandwiches, French toast or fried eggs. The most important characteristic of electric grills is even, consistent heating across the entire surface. Cooking space matters, too; after all, you don't want to cook bacon for a family of six just a couple strips at a time. If you just want a little more indoor cooking space or need a simple, versatile cooking solution on the road, our report on electric skillets may be your best option. But if you want the best in quick, convenient and high-performance electric grills, you've come to the right place. "Balcony BBQ: We Test 5 Hot Outdoor Electric Grills"
In order to find the very best electric grills and griddles, we evaluated test results and expert reviews from professional test kitchens like Cook's Illustrated. These reviews are on the old side, but the products they address are still in production, the hands-on testing was of very high quality, and the expert opinions still more or less line up with feedback from real-world users; so we feel they're still valid and useful. We also factored in feedback from die-hard barbecue and cooking experts at AmazingRibs.com and Delishably.com, and we consulted thousands of user reviews posted online at retail sites such as Amazon.com, HomeDepot.com and BestBuy.com. Ultimately, everybody was looking for the same thing: Even, consistent heat that was strong enough to sear thick hamburgers or cuts of meat. The electric grills we recommend in this report will do that and more. Enough power to recover heat quickly once you lift the lid. Temperatures of up to 600 degrees Fahrenheit.